Now that Mizzou has begun playing in the SEC, what girl hasn't thought about "dressing the part" to show we do fit in with the new conference? If you haven't quite found the right pair of shoes to wear with your black and gold sundress yet, these Mizzou College Boots fit the traditional Southern style to a T.
Handcrafted in the U.S. by Nocona Boots, these 11-inch, brown cowhide, single stitched welt boots are comfortable with a cushion insole and leather outsole. Centered on the front quarter is the Missouri logo. The suggested retail price is approximately $230, but they can be purchased for just $199 online or at a few local retailers. 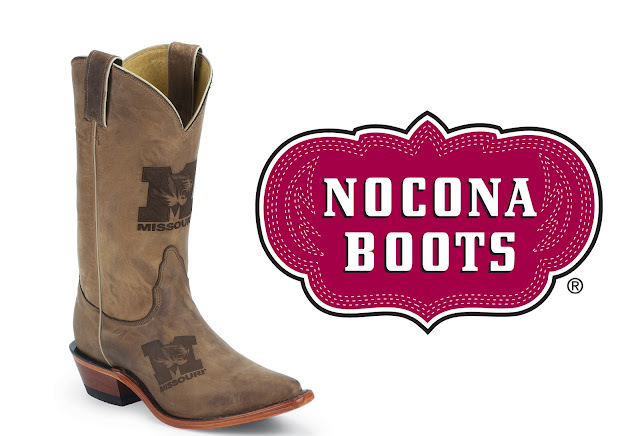 GIVEAWAY: College Gloss is teaming up with Nocona Boots to give one (1) lucky reader a pair of their very own College Boots for their school of choice! To enter, all you need to do is follow the simple instructions on the giveaway posting on our national site!